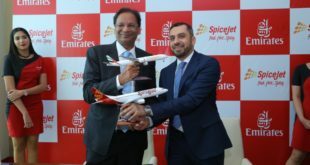 At the beginning of this year, we had a bunch of Air India miles that were due to expire. Not wanting it to go to waste, I used it to redeem a flight to the US. Unfortunately I wasn’t able to get a seat on any flight out of the major metros. The only availability to the US being from Ahmedabad. 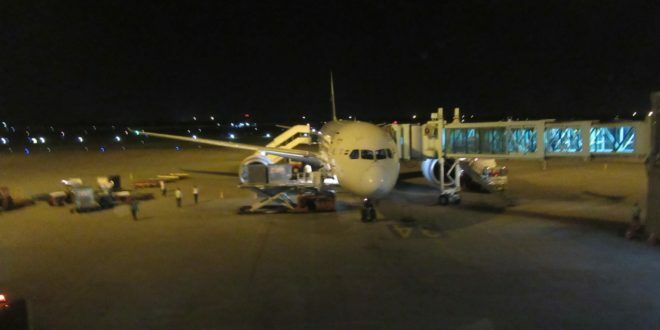 On the morning of my flight, I reached the airport at 0200 for my 0455 flight. Just after entering the airport doors, there was a long line of people blocking the passage. After squeezing my way through them, I saw the X-ray machines and realized the line was for the baggage X-ray. The long x-ray line at Ahmedabad airport with a Kuwait air sign on it. I got into the back of the line, hoping that this x-ray was for Air India since it was not marked. When I got closer to the machine, I noticed that it said Kuwait Airlines, but a passing Air India ground agent confirmed that Air India was also using this machine. I am a bit surprised that Air India has to use a foreign airline’s baggage x-ray in India. 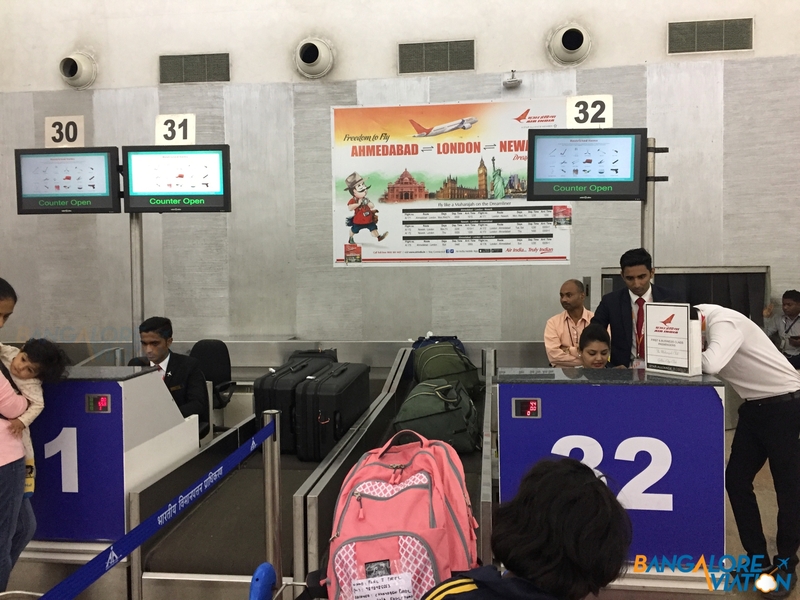 After passing the X-ray, I headed to the Air India check in desks which were the last set of check in desks in the hall. I was the second in line and was called up to the desk in a matter of minutes. For some reason the agent seemed to be having a tough time checking me in for the flight all the way to Newark and took almost 15 minutes to check me in. The last check in counter in the check in hall. Unlike my previous flight on AI, the boarding pass for this flight had FF FREE AWARD TICKET printed on it, which I found particularly cheesy. From check-in, I got into the line at immigration which was very long. It took me almost another 50 minutes to cross immigration and get into the short security line. The long line through immigration. Now we have all been told be careful of your passport while traveling, so guess what I did next. While taking out my laptop to put in a tray, I put my passport and boarding card down on the table and left it there. By sheer luck another passenger a couple of places down yelled out to me just as I was about to go through the scanner and gave my passport back to me. After leaving the lounge, I sat at a chair which overlooked the ramp and got some work done. At five minutes before the boarding, I proceeded to the gate. I reached the gate at the time printed on the boarding card where I could see ahead that boarding had already begun. As usual the gate agent checked my boarding card and passport. After crossing him, a few steps later an AI ‘Security’ person checked to see if my boarding card was stamped by the CISF. A few steps after him there were a bunch of security guys with an x-ray machine scanning some passengers bags and a metal detector that I don’t think was working. Again these people didn’t seem to have any actual responsibilities, because when I walked through the metal detector with my bag, they didn’t care and I walked ahead to the entrance to the aerobridge. 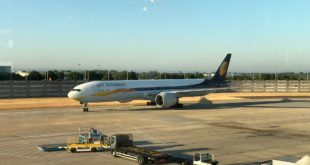 At the aerobridge entrance, an AI agent quickly checked my boarding card and marked off the sequence number and as usual a CISF guard checked the stamp. Since boarding was already at full swing when I had first reached the gate, I was towards the end of the boarding queue. 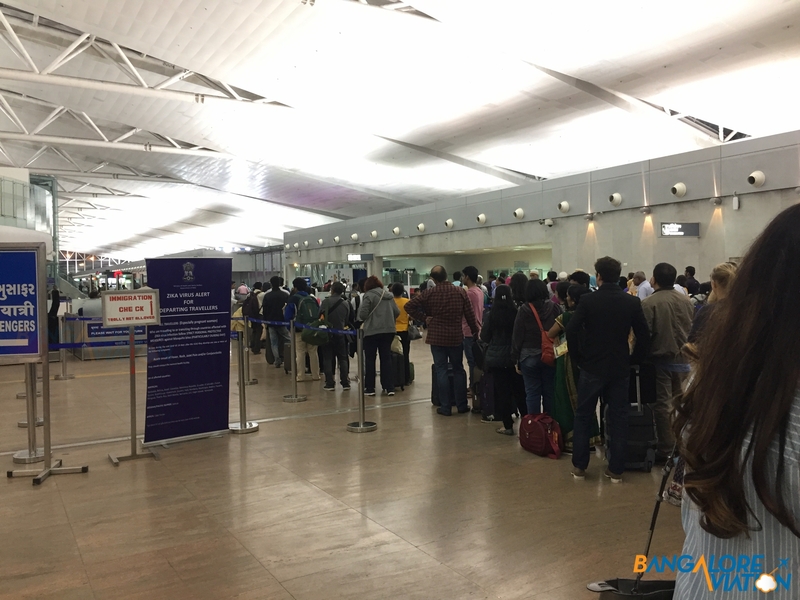 The queue kept stopping while boarding, because the crew was having difficulty finding space to stow the multiple pieces of cabin baggage most economy passengers were traveling with and no one was willing to gate check any of their bags. About a half way down the aerobridge, another AI security person looked at the boarding pass again because someone may have made a fake between the entrance of the aerobridge till that point. For those keeping count, this was the fifth time till this point that my boarding card has been checked since I reached the gate. And I had also passed three special AI security stations that did no real work. These posts seem to be around just to have more jobs in Air India. As I had mentioned in my last AI review, I have confidence in the ability of the CISF to manage security at the airport, I’m not sure what AI knows that they don’t share that confidence. As usual, upon entering the aircraft, one of the crew checked my boarding card and then escorted me to my seat. 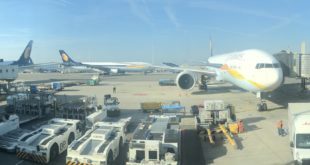 Ahmedabad (AMD) to London Heathrow (LHR). AI 171. STD 04.55 STA 10.15. All times local.15-Sep-2017. Boeing 787-8. VT-ANU. Seat 2A. 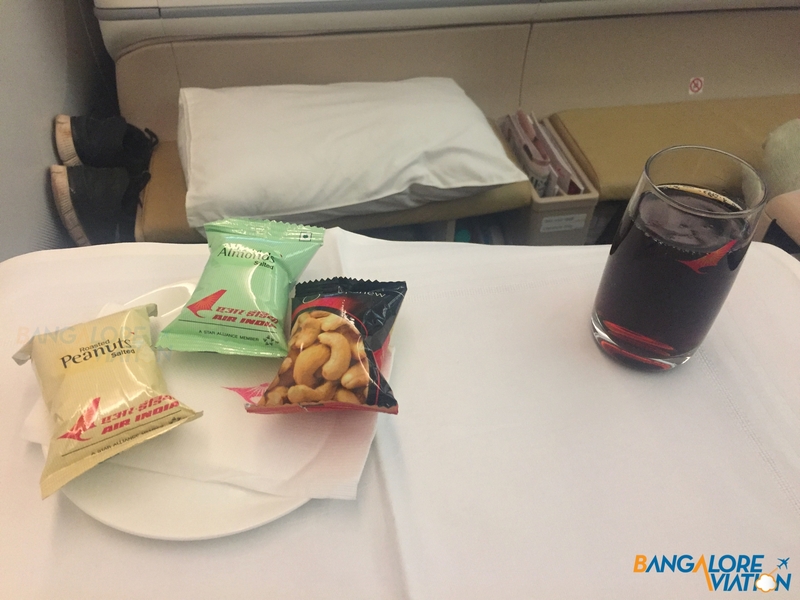 After I took my seat, I was offered a beverage – a choice between orange juice, lime juice and water. I took the water and settled down in my seat. After a couple of minutes, the lead cabin attendant introduced herself and handed me the Air India amenity cover. Unlike my last flight, they didn’t have any slippers which I really liked. 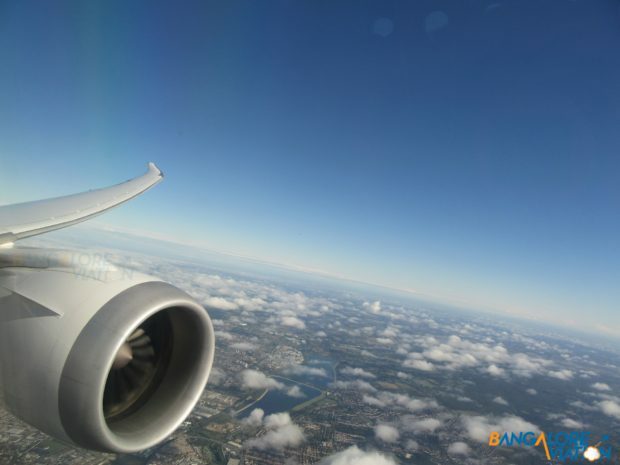 I have written about the seat and IFE on Air India’s 787 before. You can read about it here. Just as boarding completed the crew brought around a cart with news-papers and magazines. The aircraft pushed back at 05.03. About 10 minutes after we took off, the lead cabin attendant came around asking for breakfast orders. Unfortunately there were no menus on the aircraft and the only menu she had was the single dot matrix loading sheet from the catering company. Despite the issue, she very patiently and professionally read out the menu to every passenger and took their orders. After taking the order, she told me that breakfast would be served after another one and a half hours. I found this very odd, since that would have been almost two hours after takeoff. I would have expected the crew to serve breakfast as soon as possible, so that passengers flying to London could have a full nights sleep. Breakfast was served at a little under two hours after departure. I had chosen an omelette with sausages which was very good. 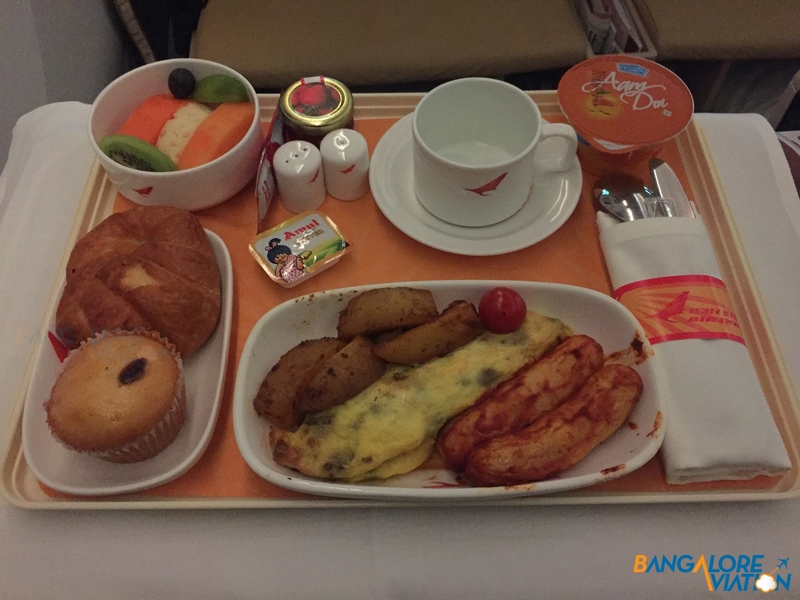 Breakfast service on Air India from Ahmedabad to London. After breakfast, I caught up on some sleep. About five hours, I woke up just as the next meal service was beginning. As I was straightening the seat, the crew asked me if I would like a drink. I asked for a glass of champagne which they didn’t have. After which I just asked for a coke. For my meal, I had chosen the achari murg with rice. The entire meal was served on a tray with a salad, bread, the meal and dessert. While the salad was horrible, the garlic bread, meal and dessert were very good. 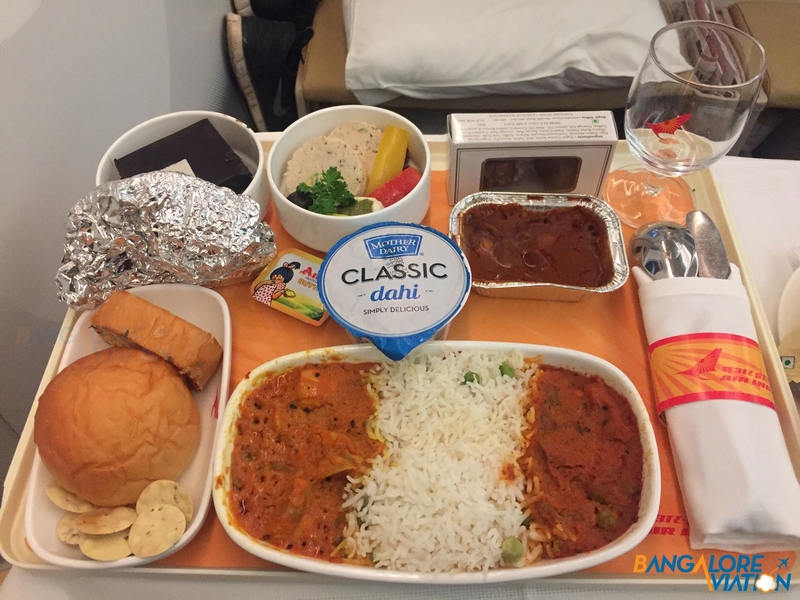 Lunch service on Air India from Ahmedabad to London. After dinner completed a cheese and fruit cart was brought around. On approach to London Heathrow on a beautiful day. The rest of the flight proceeded normally and during our descent into Heathrow, the weather in London seemed amazing. 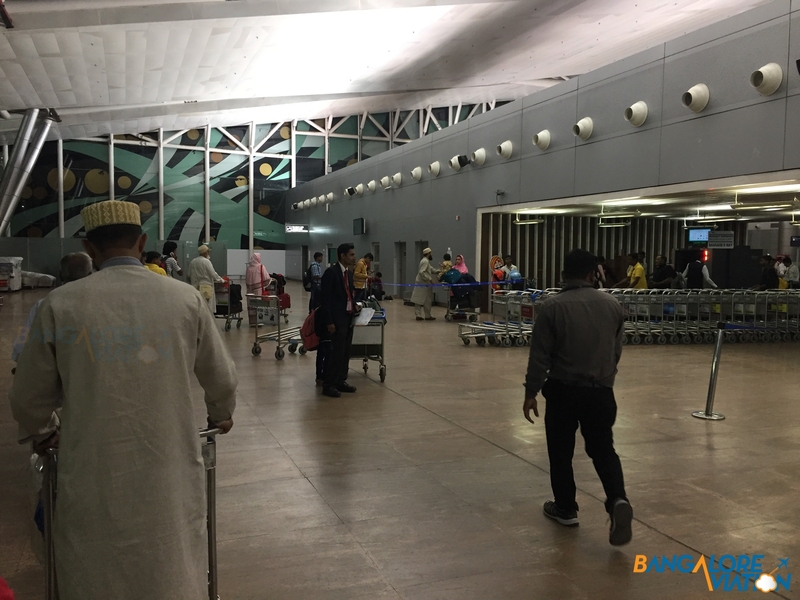 The aircraft landed about 50 minutes before the scheduled arrival time and we quickly taxied to a bus gate at terminal 2. The ramp at Terminal 2 in Heathrow. We disembarked through the stairs and onto a bus. Air India’s ground handling in the UK really knows how to get maximum use out of a bus. The ground agents made sure that they stuffed the maximum possible passengers onto the bus. When we got off the bus at the terminal, the passengers shuffled into two lines passing a couple of ground agents at the door. When I reached the ground agent, she very rudely and loudly yelled boarding pass even though I was standing with the boarding card in my hand right in front of her. After checking my boarding card was to Newark, she handed me a placard saying Air India transit. I’m not sure what this was for, since nobody else at the airport ever asked to see this thing. A short walk later, I reached the fork between transit and arrivals. The transit fork immediately leads into transit security, which was very quick. After security is an immigration check point, which led into the main duty free area in the main building of terminal 2. Unfortunately no one from the ground crew had indicated which lounge AI had contracted to use at T2. So I headed to an airline information desk and checked with them. From there I headed to the Lufthansa lounge. With a little time to spare, I headed to the boarding gate for my onward flight to Newark. When I reached the gate, most passengers were seated around the gate, so I joined them and sat down. 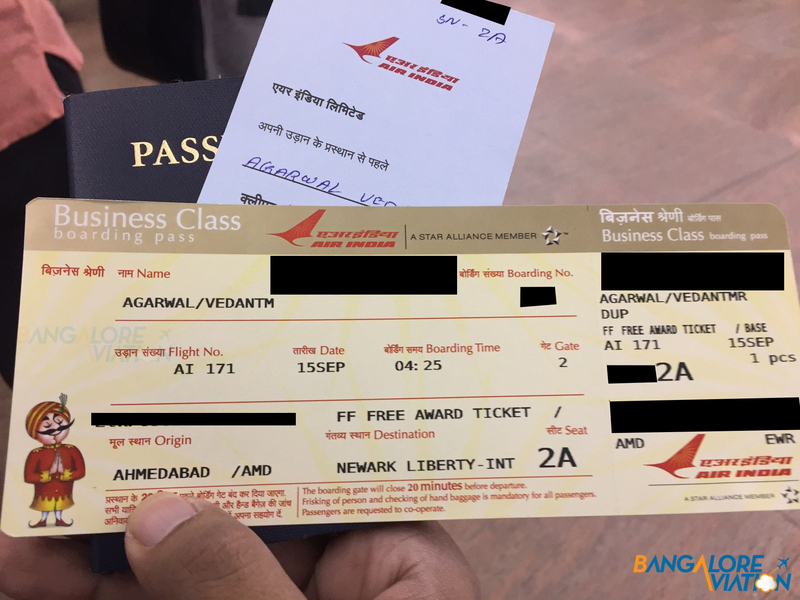 The gate agents were walking around and about 10 minutes after I reached one of them saw the CISF stamped boarding card in my hand and asked me if I was connecting from Ahmedabad. After confirming, he started yelling to the agent at the desk – ‘He’s here, we can start boarding’. It seems they had already collected the rest of the transit passengers, who were waiting after the gate check desk near the door. I’m a little surprised that they didn’t just make a gate announcement asking for any transit passengers to come to the desk or call me by name since they seemed to be waiting for me to check in at the gate to start boarding. London Heathrow (LHR) to Newark Liberty International (EWR). AI 171. STD 12.30 STA 15.00. All times local. 15-Sep-2017. Boarding begun as soon as they scanned my boarding card at the gate. The aircraft was bus boarded from a single staircase at the 2L door. The standard AI amenity envelope were lying on the armrest along with a pair of slippers. As the rest of the aircraft boarded, I was offered a refreshment drink. When the steward returned with my drink, he also brought me a menu and an amenity kit. This is the first time, I have got an amenity kit on Air India. The usual amenity cover and slippers. An Air India amenity kit. After boarding had completed, one of the crew came around with a news paper cart, unfortunately the no new material was loaded at London, so the newspapers were over a day and a half old having been loaded two flights back in Mumbai. The aircraft pushed back from the gate about 30 minutes after the scheduled departure. As usual at Heathrow we got into a line of aircraft waiting to takeoff. Amongst them on the parallel taxiway to us was a Air Canada Airbus A319 which operates from St. John’s International Airport. After we took off and the seatbelt signs were switched off, the crew quickly began a drink service using the drinks cart. On this flight they had champagne. The meal service began about an hour after departure. I had chosen the lamb option which was terrible, the meat was tough and flavorless. The potatoes and salad were a mushy mess. Only the cheesecake was good. 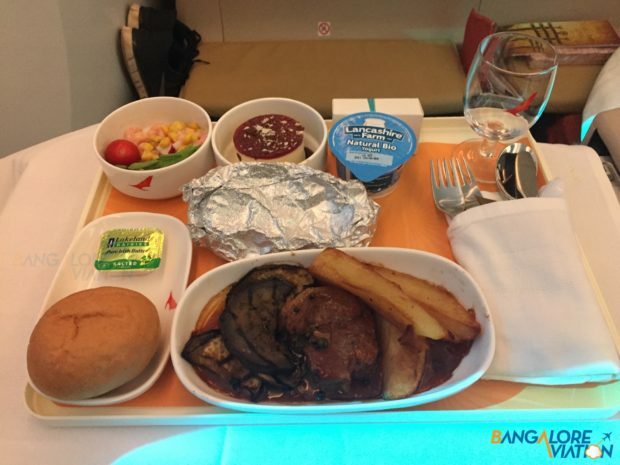 AI 171 – Meal from London to Newark. Once my tray was cleared, I settled down to watch a movie and then caught a quick nap. About four hours after the previous meal service, the steward bought me a pre-landing snack. He had brought me the non-vegetarian option which was seafood on bread with a chicken kebab side. I was trying to stop him from serving me the tray, but he insisted I try some and placed it down on my seat. Fortunately after that, I was able to tell him I was allergic to seafood. After that the steward quickly grabbed the try, apologized and asked if he could bring me the vegetarian option instead. AI 171 – Pre-landing snack from London to Newark. When he returned with the vegetarian tray, he explained that he had added the chicken kebab side to the vegetarian tray since I was only allergic to seafood. The meal itself was decent. I appreciated that the steward took the effort to combine the chicken side with the vegetarian meal. About an hour later we landed at Newark airport and disembarked quickly. On this journey, I had flown two different legs with two different crews on what could reasonably called two individual flights on the same aircraft. On the two flights I noticed two completely different in flight soft products. The first leg of my flight seemed to be lacking the most basic of things, part of the amenity kits were missing, there were no menus. The champagne was missing. But the crew on this flight were fantastic- a perfect combination of attentive and non-intrusive with great service and finesse. In short this crew would not have been out of place on a first class service of even the best airlines. The meals on this leg were good. The second leg from Heathrow to Newark was a stark contrast. All the required menus, amenity kits and drinks were loaded. The service on this leg was similar to my flight earlier this year on Air India. It was warm and attentive. But unrefined and intrusive. The meals on this flight left a lot to be desired. 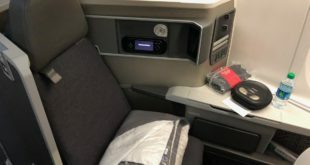 The airline has to try and ensure a more consistent product on all it’s flights. In the end, I was happy with my flight on Air India. It’s definitely not the best way to fly to the US, but at the same time I don’t really have any major complaints either. Next IndiGo follows Go Air. To increase its A320neo seating to 186.